Pune, February 9: “Gandhi family has ruled for 55 years, but unfortunately there was no change monitored in the country. Modi worked just for 55 months completing the pending schedules of last 55 years when Congress miserably failed”, said the BJP party president Amit Shah while addressing a sea of people at Shakti Kendra Sammelan on Saturday, Pune. It is Modiji who has given a quota of Rs 6000 per year for small and marginal farmers in the budget. It is he, who has set the nation on the developmental stage. Under various schemes, the poor in the nation have been benefited to support and stand by their living. They have been provided houses under the PM Awas Yojana, free gas connections under the Ujwala Yojana, health facilities under the Ayushman Bharat scheme and many more. In last 5 years, the Modi government have used the power to provide electricity to 2.5 crore households. The government has also done efficient task of giving loan to 13 crore youths under the Mudra scheme. He meanwhile blamed the Congress for delay in the decision of Ram mandir, assuring that the issue will be fast resolved only with the NDA government being in reigns. Praising the act of surgical strike in year in year 2016, Shah said that earlier America and Israel owned the label of taking revenge for the death of their soldiers but Modi ji added India to the list by heading surgical strike to Pakistan. The security of the Indian borders and their protection is our first priority. This time the government has also approved highest defence budget of Rs 3 lakh crore, he added responding to the lauds of masses. Further Shah claimed of having special attachment with the people of Assam and the northeast. It is the Modi government has implemented the one rank one pension scheme within a year of power attainment. 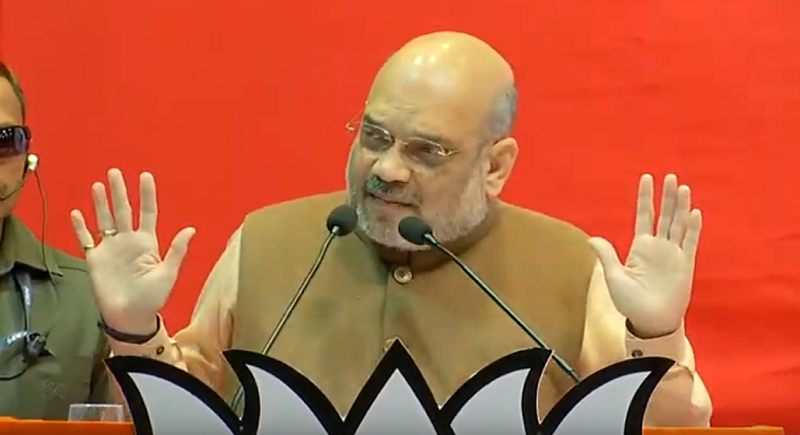 “If you refer again to the Modi government this time in 2019, we will eliminate all the intruders right from Kashmir to Kanyakumari and from Kamrup to Kutch”, he added further. Meanwhile, Maharashtra CM Devendra Fadnavis said that in the last elections, we lost seats in Baramati very close, but not this time. We will win over in Baramati along with Maval and Shirur. “In the forthcoming Lok Sabha elections, BJP will be contesting 48 seats”, declaring that Raosaheb Danwei will be the face of Baramati, the 43rd position. Union Minister Prakash Javadekar, State President Raosaheb Danwe, Guardian Minister Girish Bapat, Pune City MP Anil Shirole, Yogesh Gogawale and other senior officials were also present on the occasion.